Brokaw in better days; The chimney may be preserved. 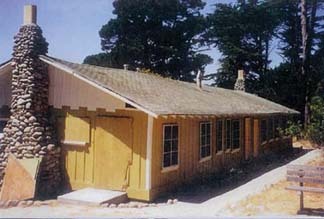 Citing the 2006 International Property Maintenance code and Pacific Grove Municipal Code, Pacific Grove’s chief Building Official, John Kuehl, has sent a Notice and Order to Demolish Brokaw Hall, the building in the Butterfly Sanctuary, to City Manager Tom Frutchey. In his March 29, 2011 letter, Kuehl ordered a 5-foot fence around the structure, a minimum of 10 feet from the building, and ordered its demolition by April 29, 2011 – after obtaining a clearance from the Monterey Bay Unified Air Pollution Control District. • The building lacks a proper foundation. It originally had a wooden foundation, which has deteriorated to the point of failure. The building has begun to settle. • Exterior surfaces have decayed and allowed water to enter the building. “The wall and ceiling material is so saturated with water that it is becoming dislodged from the supporting elements,” he states in his letter. • Due to termite infestation, water saturation and sheer age, the roof structure is beginning to show severe mid-span deflection in four places. Wall framing members have decayed to the point of disintegration where they meet the roof rafters. • The building has many areas of termite infestation as well. In his letter to the mayor and city council, City Manager Frutchey said that in discussions with Kuehl, it was agreed that the two historic fireplace-and-chimneys can be saved, but that the City would be better off with the building being demolished and rebuilt than to attempt to restore it board by board. The normal steps required by City and State codes to demolish a historic structure do not have to be followed in this case, he says, because of the emergency. “. . .given the importance of this structure, however, I believe they should be followed to the extent possible.” He has called for an extensive public process to decide what to do next, hopefully before the 30-day period allowed by the Building Department. A public meeting will be announced soon, Frutchey said in his letter.